We like thatched cottages, they remind us of gentler times and the countryside. There are plenty of thatched cottages to see in Devon. 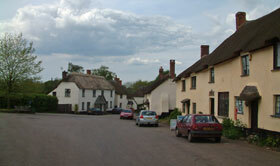 The photograph on the left is of the thatched village of Broadhembury in east Devon. Because of the sheer number of thatched cottages in Devon as well as further afield in country areas of England, there is plenty of work for thatchers and you may be fortunate enough to spot some at work, tying their bundles of reeds to the roof frames. It takes several weeks to thatch a house, it requires skill and experience and results in a water tight and attractive roof. Long straw used to be commonly used but reeds create a sharper outline. 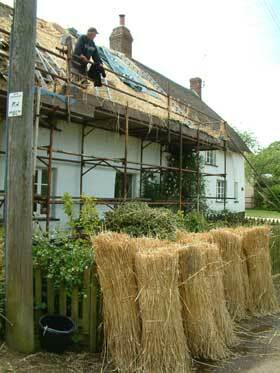 A straw roof can be expected to last up to 25 years, a reed one perhaps up to 50 with some maintenance. The reeds come from wetland areas of Britain. It's the British preference for rural charm that keeps demand for thatch alive and helps create charming thatched villages like Broadhembury in east Devon that are a pleasure to walk around and explore on holiday.